With just ten weeks to go before Brexit day, one might have thought that our MPs could bring themselves to focus on the issues at hand, and get down to sorting out the exit process. Clearly, though, Jeremy Corbyn hasn't got the memo. Occupying the trivial post of leader of the (main) opposition, it doesn't seem to have occurred to him that he might have a role to play in working with the prime minister and other opposition leaders to resolve the political crisis of the century. Instead, our revered leader has decided to throw a wobbly, demanding that Mrs May takes no-deal "off the table" as his price for cooperating with her. Of all the various explanations for this behaviour, it would be comforting to think that Mr Corbyn really doesn't want to play and this is his way of breaking the news. The alternative – that he really doesn't have the first idea of what he is talking about - is simply too shocking to contemplate. However, that is the line Mrs May has decided to take, giving him the Janet & John treatment in a letter which sets out the reasons why ruling out a no-deal is an "impossible condition". It is, she writes, "not within the Government's power to rule out...". Then, in a deliciously patronising tone, she goes on to say: "Let me explain why". Under Article 50 of the Treaty on European Union and the Withdrawal Act 2018, "we will leave the EU without a deal on 29 March unless Parliament either agrees a deal with the EU or the UK revokes article 50 and chooses to stay in the EU permanently". This might be a little more convincing if Mrs May was slightly more precise with her terminology. Parliament is not in a position to agree a deal with the EU. That is the UK government's function. Its task is to ratify the deal. And then, being a treaty provision, the UK cannot revoke Article 50. Rather, the government might unilaterally revoke the Article 50 notification, thereby rendering null and void the intention to leave the EU. Nevertheless, we get the drift of what she is saying, which she helpfully summarises by saying that there are two ways to avoid a no-deal: "either to vote for a deal … or to revoke Article 50 and overturn the referendum result". With that, Mrs May tells us she believes "it would be wrong to overturn the referendum result". It follows, therefore, that Parliament needs to be able to reach a consensus in support of an agreement with the EU, "which would avoid a no deal outcome" – the very thing Mr Corbyn seems reluctant to do. And, while Mrs May's door "remains open to a meeting without precondition", Corbyn's follow-up move was to write to his MPs urging them to "refrain from engagement with government until 'no deal' is taken off the table". 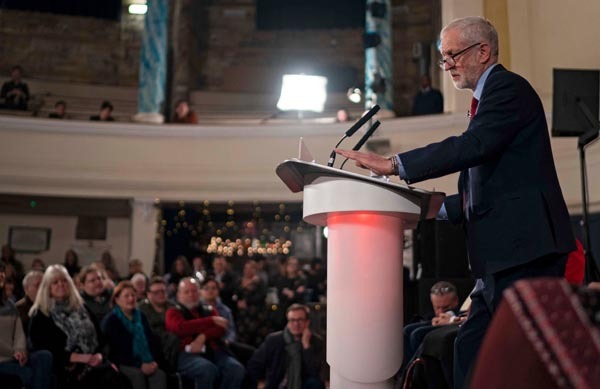 Earlier, speaking to Labour supporters in Hastings (pictured), Corbyn dismissed Mrs May's initiative as a "stunt", declaring: "I am quite happy to talk. But the starting point for any talks about Brexit must be that the threat of a disastrous no-deal outcome is ruled out". He added: "If she won't accept the will of parliament and take no-deal off the table, it will show that she simply isn’t serious about reaching a deal". Looking at this exchange in the round, I suppose we could take it as yet more evidence of the infantilisation of politics, although we have a way to go yet before we reach rock bottom. Helping us on the way is Nick Boles, who joins with the Guardian in a staggering display of political naivety, compounded by the art of the headline writer in highlighting the accumulated absurdities. The headline itself takes us straight to the depths, as it declares: "Tory MP plans bill to make no-deal Brexit legally impossible", with the sub-heading: "Pro-remain cabinet ministers back bid to block EU departure without deal, Nick Boles says". To an extent this clarifies my piece yesterday – in the sense that we can better see quite how far sanity has been left behind, aided by sight of an unamended version of the Bill that Boles is tabling. The essence is that, should the Withdrawal Agreement not be ratified on or before 11 February, the prime minister will be required to seek an extension of the Article 50 negotiating period, having it terminate on 31 December 2019. Assuming that the EU would then be able to pull together the unanimous agreement of all 27 Member States, not in any ordinary use of the English language could this be taken as rendering a no-deal Brexit "legally impossible". All it does is kick the can down the road a further nine months. And after that, in the absence of any deal being ratified, the no-deal would kick in then. Normally, of course, Private Member Bills get short shrift in the Commons, but, to force the government to grant time for his Bill, Boles is planning to table an amendment to the government's Brexit motion set for 29 January. This, if adopted, would give Boles's Bill the necessary time, allowing it to take precedence over government business. From this, it is evident that Boles has a significant hurdle to overcome, just on getting the time for his Bill to be processed. And even if he claims the support of cabinet ministers, that in itself doesn't buy him a majority in the House. But supposing, by some miracle, he managed to get his Bill passed, and then prevailed upon the EU to grant a nine-month extension, his purpose is to facilitate the negotiation of a "Norway-style" agreement, which in a previous iteration had him wanting the existing Withdrawal Agreement ratified. But, amongst the other problems he is glossing over, Boles is taking on the Efta/EEA option which, if addressed sensibly, would probably take at least two years to negotiate, on top of which there are the supplementary bilaterals which would need to be agreed before we have an effective working relationship with the EU. In other words, even if everything went swimmingly for Mr Boles, it doesn't even begin to provide a solution to Brexit. It is simply a time-wasting distraction to add to all the distractions which are taking MPs' eyes off the ball. One wonders, therefore, whether this is not so much distraction as displacement – a variation on bicycle shed syndrome. MPs, unable to address the relevant issues, are devoting their time and energies to irrelevant matters, simply to give the impression of purposeful activity. However, one could perhaps not accuse the French of this sin, its government having yesterday "triggered" its contingency plan to deal with a no-deal Brexit. This comprises "legislative and legal measures" aimed at ensuring that there is no interruption of rights and that the rights of citizens and businesses are effectively protected. Five ordinances will now be presented to the French cabinet next Wednesday and published in the next three weeks, "providing a legal framework that meets the challenges of a no-deal Brexit". This will include measures to restore border controls and a plan to invest about €50 million in French ports and airports. In the coming weeks, 600 additional "state agents" will be recruited, amongst them customs officers and veterinary officials. A plan to support the fisheries sector, which is "most likely to be hit hard" is also under consideration. One should note here that this merely creates the legislative framework, and authorises spending. Implementation is another matter, and it will take considerably longer than ten weeks to get systems in place. Then we should recall the evidence given by Jacques Gounon, President and CEO of GetLink to the Special Committee of the French National Assembly and Senate on 16 October 2018. Since there are nine seaports to cover, a number of inland ports and the international airports such as Roissy-Charles-de-Gaulle, the recruitment of 700 customs officers "will certainly be insufficient given the flows - 24 hours a day". For example, Gounon says, the control centre at Boulogne-sur-Mer is closed between midnight and five o'clock in the morning. But the Channel Tunnel concession requires it to operate 24 hours a day, 365 days a year: goods reception facilities cannot close at night. For public services, this is a considerable challenge. He also goes on to point out that ports which handle shipping containers use the Cargo Community System (CCS), a pre-declaration system which allows the containers to be tracked. But, he says, this system is for containers for which you have reasonable notice, not for trucks. For example, when containers come from North Africa, there is 48 hours notice. Trucks loaded in a logistics centre outside Paris arrive at the Channel Tunnel or the port of Calais 2-3 hours later. To date, says Gounon, there is no computer system capable of handling these extremely short pre-declaration periods. Thus, for all the fanfare of yesterday's announcement - which even merited a BBC report - if it isn't displacement activity, it certainly is gesture politics. There is little chance that France will be ready to meet the challenge of a no-deal Brexit. Thus, even the ingenuity of Mr Boles seems hardly necessary. Day after day, we are getting indications that the continentals are no more prepared for a no-deal than we are. At some time, therefore, we might expect there to be serious proposals for running Brexit into injury time. But, if our MPs can't grow up, and treat Brexit seriously, freed from party political games, there is one action which most definitely is not displacement activity, with the Ministry of Defence calling out the reserve. Reserve Forces "will be on standby to deliver a range of Defence outputs", which doesn't rule out the possibility of there being troops on the streets after Brexit day. And something tells me that, if they are called upon, they will not be there for a Brexit Day parade.